Sita asks Ram is this justice to ruin one’s home and set other’s home. Ram says no, this is not Dharm and not according to any justice, but why are you worried. Sita asks is this not true that you have killed many Asurs, did we think how many homes did we ruin. Laxman says but Asurs faced what they did with Rishis and Grahamvaasis. Ram asks Sita to see the Grahamvaasis whose families were killed, they were innocent people, you tell me if anyone kills innocent Rishis, is this right. Sita asks are you sure that the arrow which you shot just killed the culprit Asurs, or any innocent Asurs…. Are we not responsible for their death. Ram says Asur and innocent? Rahu says what shall we do now, he came infront of us. Hanuman calls them fools and laughs. Rahu says turn the chariot and run. Hanuman beats them. Rahu says he is beating us a lot, what to do now. 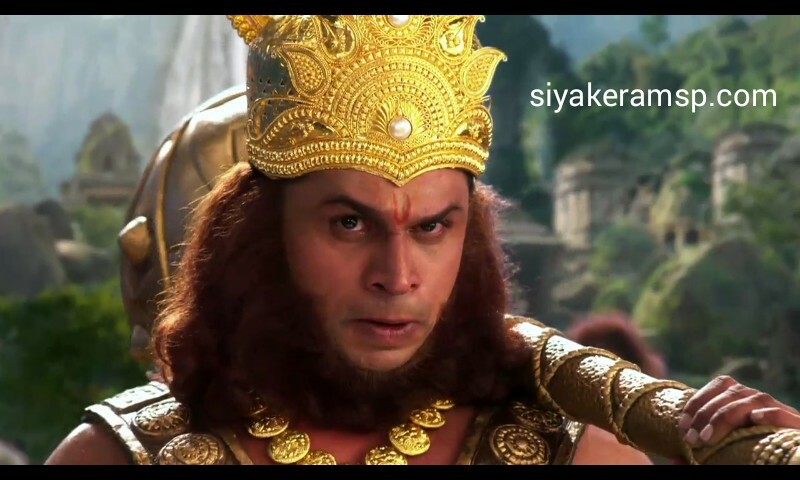 Ketu says I think we did big mistake by coming infront of Hanuman. Rahu says we don’t have any option, Meghnadh would have beaten us if we did not come here. Ketu says there is just one way now, Paatal lok. Hanuman follows them. Sita says by some Asur’s crime, assuming all Asurs are culprit, how is this right. Ram says I m not able to understand. Sita says its not necessary that all Asurs are same, history knows many Dharmatma Asurs like Raja Bali have placed Dharm in the world by their good behavior, then how can we think all Asurs are same and killing all of them is not right. Ram says you said true Sita, but whatever we did was just for good for the world, we did our Kshatriya Dharm according to our Maryada. She asks about Maryada and Dharm to make any woman widow and make any kid orphan. Ram says Sita, sorry. Laxman looks on. Ram says I don’t know why are you so worried, but when a big tree falls on earth, earth shakes, its nature’s rule, likewise if any man of family does crime, the family has to bear the result of his bad deeds. For society, civilization, culture, Dharm and Maryada, we killed Asurs, I don’t think we did any crime. Sita says then come with me, I will show what crime we did. Laxman looks on shocked. Meghnadh’s uncles Mayavi and Dundhvi talk about killing Bali. Mayavi says our power will get half after going infront of Bali. Dundhvi says I got a solution and tells him. Mayavi laughs and says you found a good solution, just human’s power can get half, a bird/animal’s power can’t get half infront of Bali, if you turn into animal and attack Bali, we can kill that monkey. Dundhvi turns into animal. Mayavi laughs. Hanuman looks for Rahu and Ketu. They hide. Hanuman says they are definitely here. He smiles. Ketu falls down and gets hurt. Rahu asks are you fine, get up. Hanuman catches them. He says you both were going to eat my Surya Dev, why are you waiting here. He beats them. Rahu says we lied to you, we did not come to eat your Surya Dev. Hanuman says I knew it, tell truth why did you come to Anjan mountain. Rahu says we can’t tell you. Hanuman says you have to tell it. Mayavi in villager disguise asks any Kishkindha vanar/monkey to fight with his bull. He challenges everyone and calls all monkeys cowards. Sugreev comes there and looks on. Mayavi tells Dundhvi that this is our aim. Dundhvi says today Sugreev will die. Sugreev asks Mayavi who is he calling coward, this is land of bravery, if you want to see bravery, then see. Bali comes there and stops Sugreev. Bali asks Sugreev to wait, he will battle with this bull. Mayavi says I don’t have any problem VanarRaj, but no one failed my bull, Kishkindha can lose their king. Bali says decision will be known after the battle. Bali fights with Dundhvi. Sita gets Ram to the Asur’s families and says these are the women whose innocent husbands died by your arrows, the boys become orphans, they will grow up and become criminals, as they learnt by their experience that living innocent life is big crime. Ram looks at the Asurs families. Sita says you said you did not do crime by killing any Asurs, but don’t these women and children have right to live, there is no one to get food for them, don’t you think injustice happened with them. Ram says no need to be scared of me, you all are safe in this jungle like any Rishi and humans, you can live in this jungle freely, you can make homes according to your comforts, I assure you will be safe here and takes their responsibility. Sita smiles. Ram hugs the Asur’s child. Ram promises Sita that he will not kill any innocent Asurs from now, even if Asur did serious crime, he will give Asur a chance to change, if Asur promises to not do any crime in future, he will not kill that Asurs. The women and children thank him. Ram smiles. Raavan sees the soldiers dead and tells Malyavaan that Surpanakha has run away, she might have definitely gone to Dandakaranya.. He gets angry.